Single digits indicate generation, beginning at 1 for the parents of Hugh Carr. Pediatrician and sickle cell anemia expert Dr. Charles Francis Whitten was born on February 2, 1922 in Wilmington, Delaware to school teachers Emma Clorinda Carr Whitten and Tobias Emmanuel Whitten. He grew up on Wilmington’s East Side next door to future jazz trumpeter Clifford Brown. Whitten attended Number 5 Elementary School and graduated fourth in his class from Howard High School in 1940. In 1942, he earned his B.S. degree in zoology from the University of Pennsylvania. Whitten then studied medicine at Meharry Medical College in Nashville, Tennessee and earned his M.D. degree in 1945 at age twenty-three. After his internship at Harlem Hospital, Whitten worked as a general practitioner in Lackawanna, New York from 1946 to 1951.Whitten then served two years as a captain in the United States Medical Corps before returning to the University of Pennsylvania’s Graduate School of Medicine for a year of advanced study in pediatrics. In 1953, Whitten began a two-year residency in pediatrics at Children’s Hospital in Buffalo, New York. In 1955, he moved to Detroit, Michigan for a one year fellowship to study pediatric hematology under Dr. Wolf Zeltzer. Whitten became the first and only African American to head a department in a Detroit hospital when he was selected clinical director of pediatrics at Detroit Receiving Hospital in 1956. Whitten worked as an attending pediatrician at Children’s Hospital of Michigan from 1962 to 1999. He started teaching medicine as an instructor in pediatrics at Wayne State University in 1956. Whitten was named assistant professor in 1959, served as full professor of pediatrics from 1970 to 1990, and became associate dean of curricular affairs in 1976 and of special programs in 1992. Whitten joined Dr. Charles Wright in establishing the African Medical Education Fund in 1960. In 1969, Whitten instituted Wayne State University’s Post Baccalaureate Enrichment Program to better prepare black students for medical school. In 1971, Whitten with Dorothy Boswell spearheaded the National Association for Sickle Cell Disease, now the Sickle Cell Disease Association of America. He also formed the Sickle Cell Detection and Information Center. Whitten became program director for the Comprehensive Sickle Cell Center at Wayne State University in 1973. In 2002, Whitten was named Michiganian of the Year, and in 2004, was named distinguished professor of pediatrics, emeritus at Wayne State University. Whitten passed away on August 14, 2008 at the age of 86. He is survived by his wife, Eloise Culmer Whitten, an expert on pre-school reading. Together, they supported a number of worthy causes, including a clinic in Haiti. Whitten was interviewed by The HistoryMakers on March 8, 2007. The first mention of Thomas and Fanny Carr is in the marriage license of Hugh Carr to Florence Lee in 1865. Thomas and Fannie are identified as Hugh’s parents. The census of 1870 has Thomas Carr, age 65, on the W.W. Worledge Farm, as the head of the household. Other members of the household include Fannie (age 58), Hugh (age 30), and Armstead (age 26). Fannie (age 70), Hugh (age 30) and Armstead (age 25) are also identified in the 1870 census as living on the R.W. Wingfield farm but Thomas is not in that household. Note the discrepancies in ages, in spite of coming from the same census; our research often revealed such conflicting data. In an 1875 contract to work on the Wingfield farm, Hugh Carr is given a house for himself and his mother, although his mother is not identified by name. This is the last reference to either parent as living. Neither is found in the 1880 census in Albemarle County. There are primitive field stones next to the house at Ivy Creek that may be the burial site of one or both of them, but that is pure conjecture. Research into the graveyard continues. It is organized by owner and only records female slaves having babies between those years. Louise, Mary, and Annie are in the Carr daughter’s names. Clarinda is baptised along with Hugh, Frances, Thomas, and John into the First Baptist Church of Charlottesville. They are recorded as belonging to R. W. Wingfield. Clorinda is recorded as head of her household on the RW Wingfield farm living next to Hugh Carr’s household. Armstead Carr is in the household next to Hugh. This is the last we hear of Clarinda or any of her children. Hugh Carr named one of his daughters Emma Clarinda ‘after Hugh’s sister’ her children are told. There are several Thomas Carr’s in the 1870 census. In the 1880 census Thomas Carr (age 45) and family are living next to Hugh Carr and recorded as ‘farm laborer’. Hugh Carr owns the land and is recorded as a farmer. In 1887, Thomas Carr age 52 remarries (widowed) to Alice White. He identifies his parents as Fanny and Thomas. Can’t find Thomas or family members after 1880. Armistead Carr belonging to RW Wingfield is baptised in 1861 into the First Baptist Church of Charlottesville. Signs with his mark a contract in 1868 to work with Hugh Carr on the Sutherland farm. Gets married on December 30, 1869 to Eliza Holmes, he identifies his parents as Fanny and Thomas. In the census of 1870, Armstead and Eliza are in the household next to Hugh Carr on the Wingfield farm. In the same census, Armstead is in the household with Thomas, Fanny, and Hugh on the Worledge farm. 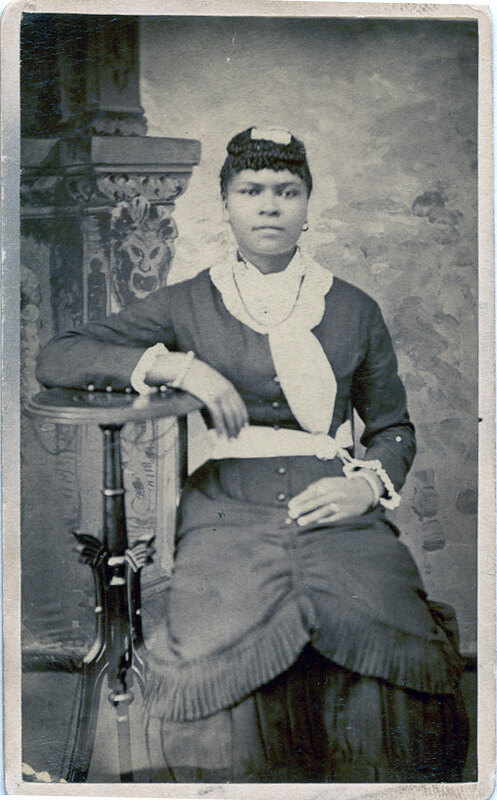 Armstead (age 43) is remarried on 9/7/1893 to Bettie Kirby of Rappahanock. He is identified as a laborer and widower. Armstead, age 45 ?? in Charlottesville with wife Bettie, married 7 years. They own their house, it is mortgaged. He is identified as a laborer. Girls can both read and write, but Armstead, Bettie and Cornelus cannot. One of the children is Bettie’s but don’t know which one; suspect it is Cora. In the Charlottesville (city) directory we find Armstead several times. 1910 census has Armistead (age 60), and Betty (age 44) living with Cora Brown (daughter) and John Brown (son-in-law) and Harry G (grandson) and Cloris (Cora is identified as having 2 children so Cloris must be her child). They live in Preston Heights. 1920 census Armstead, age 72, with wife Bettie, age 64 and (grandson?) Harry, age 11. Armstead can read, but not write. Bettie cannot read or write. Harry can do both. They own their home, free of mortgage. He is a gardener. Armstead Carr, father Thomas Carr, died 2/7/1931 leaving wife Bettie. Buried at the Oakwood Cemetery in the City of Charlottesville.